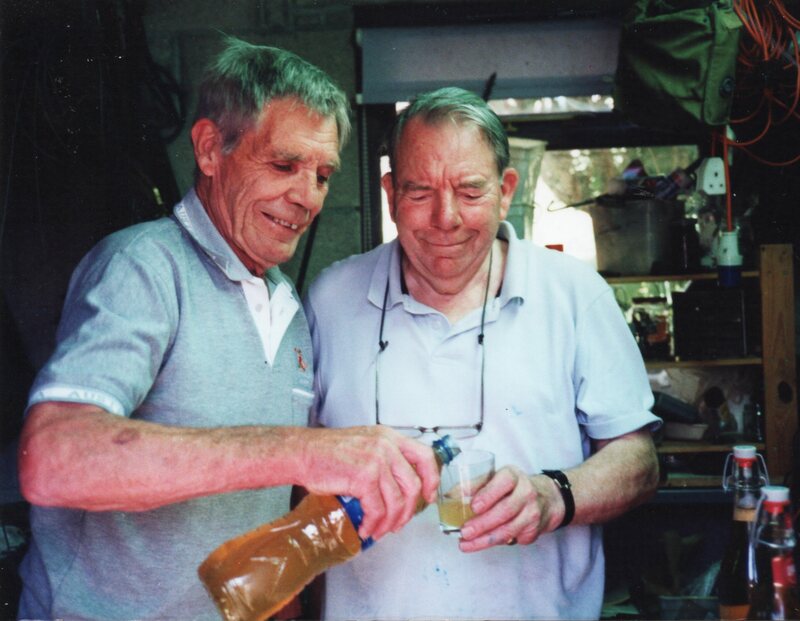 Eric and his friend Steve enjoyed many hours together on various hobbies, one of which was brewing their own cider. This was done annually in our garage, so I had to remove my car for some time whilst Eric set up the brewing kit, all of which was tracked down and purchased in the locality. The end of the garage was the home of a very substantial cider press, and he and Steve spent happy hours collecting apples from various places and chopping them up. This made a considerable mess and the scent of cider filled the air and drifted up into the garage loft space, where it remained for some time afterwards. 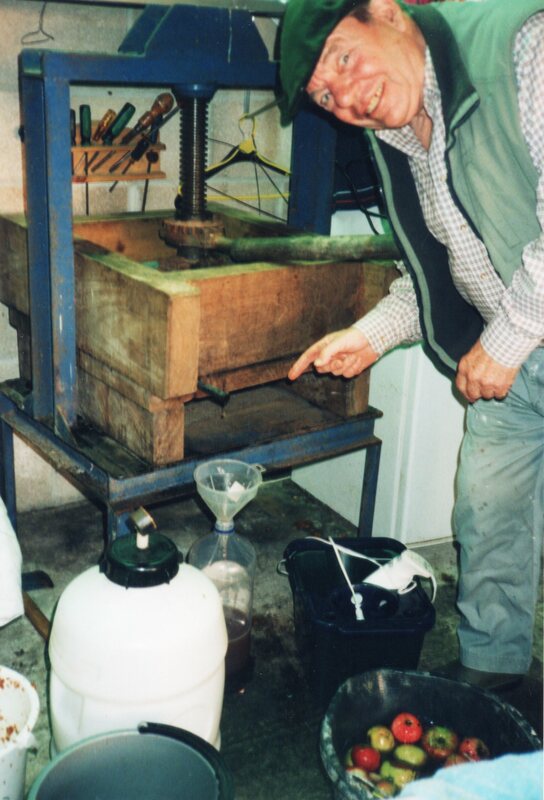 Eric was renowned for producing strong cider, and all male visitors were usually beckoned into the garage where it was stored to partake of the brew – one or two making an excuse to avoid a second invitation. At home one morning, Eric was fixing the catch on our loft door when I heard a loud thump, followed by silence. Hurrying anxiously upstairs thinking he had dropped something, I found a bemused Eric picking himself off the floor with a lump the size of an orange on his forehead where the trap-door had struck him. He was bleeding profusely and staggering a bit, so I put him to bed for a while and we then went to the surgery, but thankfully he didn’t have concussion. He spent the next day in bed but later escaped back to the task of cider making, returning alone from a nearby farm with several full sacks of Bramley apple windfalls. The following morning I glanced at my husband, anticipating the bruised bump but, to my horror, below it was a black eye – which became progressively blacker as the week went on before both wounds became an interesting shade of yellow; the villagers in the local pub had a field day! Eric told me he’d been carrying a full sack through the orchard on his own, and a branch had grazed his eye. Both injuries must have hurt terribly but, to my amazement, Eric acted as if nothing had happened. He always prided himself on being stoic and maintained that he said nothing to stop me ‘freaking out’. I must say he was always the easiest of patients – but would ‘fly off the handle’ sometimes over something so trivial I never saw it coming!